Travel on I-70 and take exit 160, Airport Road and turn South off the exit. We are located directly behind/adjacent to Wendy's at 5005 East Pike, Zanesville. Fyda Freightliner Western Star Zanesville (Zanesville, Ohio) is conveniently located on I-70 and Airport Road, Exit 160. We carry a large inventory of new and used heavy- and medium-duty commercial trucks. New Freightliner and Western Star trucks are available, along with a wide variety of pre-owned vehicles of all makes and models also on hand. You want it - we will find it! The parts department carries over $1.5 million in Freightliner and Western Star OE parts as well as a full line of all-makes truck parts and components. Selected trailer parts are also available. We offer free parts delivery in area. The 24-bay service department offers full maintenance and repair services including Express Assessment and Rapid Repair, and features a chassis engine Dyno and Hunter computerized alignment rack, and more. We are a certified warranty repair center for Freightliner, Western Star, Detroit, Mercedes, Cummins, Eaton & Meritor. Come to us for DPF & DOC cleaning & maintenance, flywheel machining, and glass & radiator repair services. Fyda Zanesville is open six days a week for the convenience of our customers. Fyda Freightliner Western Star Zanesville located at 5005 East Pike, Zanesville. Full service truck dealer. 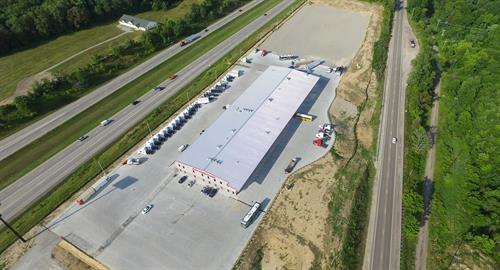 Aerial photo of our dealership located on I-70. We operate 24 service bays with state-of-the-art features designed to maximize throughput and get customers moving faster. Mobile column lifts in our service shop. 5-Ton overhead crane in our service shop. We have the only chassis engine DYNO in the area to diagnose issues with your truck. We carry over $1.5M in OEM and aftermarket/all-makes truck and trailer parts inventory and offer free delivery in area. Our parts store is open extended hours six days a week. We offer a wide variety of truck and trailer parts and accessories.